Platinum Three in One Engagement, Wedding and Eternity Ring — Form Bespoke Jewellers Ltd.
A bespoke three in one ring cast in platinum. This unique ring was designed by the customer to incorporate an engagement ring, wedding ring and eternity ring. Developed alongside our expert jewellers, the design was created on CAD and then cast in bright white platinum. The design boasts three bands with the illusion that they are interlocking. In fact, the bands are stemmed into one shape, blended together with a smooth tactile finish on the inside. At the centre of the three bands is a bold, round brilliant cut diamond. This is hand set in a neat four claw setting. Mirroring this setting, and running down the shoulders of one of the bands, are then six more round brilliant cut diamonds. All the diamonds are of matching colour and clarity to create a flawless sparkle. The other two bands have been left plain and highly polished providing a beautiful contrast. 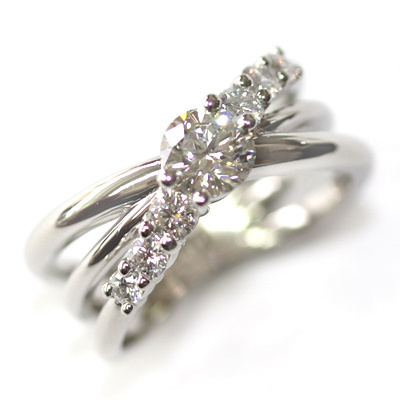 We think this is a truly stunning ring where the customer has made the most of what a bespoke jewellers is all about. They have come to us with a unique design and worked alongside our team to develop a beautiful and unique three in one ring.